Terminal Records are crucial to processing Execu/Touch POS properly. Each physical workstation or handheld device must have a unique terminal number. That terminal number is determined by the Execu/Tech shortcut settings. For information on correctly setting up POS terminals, see Software Installation . See Create Short Manually . See ETShortcutWizard . You MUST read Execu/Tech's System Requirements prior to setting up new POS workstations. You may configure the Terminal Setup Record from any workstation. "Terminal:" is the number for this terminal, as determined by the Execu/Tech shortcut for this terminal. "Description:" is the location or function of this terminal, such as HOST, F&B ADMIN, CASHIER2, etc. You may enter any description you wish, up to 20 characters. "Revenue Center:" is the revenue center for this terminal, up to 10 characters. See Departments/Revenue Centers . This is optional. "Receipt Printer:" is the unit number for the receipt printer for this terminal. Receipts as well as presentation checks will print from this terminal. See POS Printer Setup . "Print logo? :" will print your logo on the receipt if this field is set to Y. This works for Epson printers only with specific drivers; instructions are provided by Epson. "Keyboard type/font size:" Enter T in the first field if you are using a touch screen computer. Enter H in the first field if you are using a Handheld device. You may leave the second field blank, or enter M for medium font and L for large font. "Terminal location:" should be blank except for the following: D or drive-through; T for Take-out: C for Cafeteria; X for a workstation that should not be logged out at POS End of Day - for example a clock-in/clock only terminal. "Print check when Done/New? :" if Y will automatically print a check when Done/New is selected at item entry. N will not print a check automatically when Done/New is selected from this terminal. "Print time on each line of check? :" if Y will print on the guest check the time of day each item was ordered. "Allow 'open cash drawer'? :" if Y will allow the cash drawer to open for this terminal. N will not allow the cash drawer to open. "Print check when closed to cash? :" will allow three options: Y will print a check when closed to cash. N will not print a check when closed to cash. Q will not print a check when closed to cash for Quick-key employees but will print for others. See Employee Records for explanation. "Inventory location/ company:" is optional and defines the company or location for inventory for this terminal if you are using Execu/Tech's Inventory Control module. "Default table section:" sets the default table section to display for this terminal (except for Quick-Key employees). See Table Setup . "Optional customer display unit no. :" corresponds to the printer unit number assigned to an EMAX compatible customer display. This field should be 0 (zero) unless you have contacted Execu/Tech regarding customer display unit setup. The next section assigns the menu and alternate menu to display through the day and week for this terminal. Each terminal may have unique settings or terminals may have identical settings. "Start Time" should be 00.00 for the first line even if your venue does not open until a later time such as 5:00 am. This allows you to access the system outside of business or service hours. Time should be in this format: 5:30am = 05.00 and 5:30pm = 17.30 with 24.00 being midnight. As shown above, the first menu's service time is 00.00 (beginning right after midnight) to 11.00 which is 11:00am. "End Time" should be the ending time for this menu or service time. Time should be in this format: 11:30am = 11.00 and 11:30pm = 23.30 with 24.00 midnight. As shown above, the first menu's service time ends at 11.00 which is 11:00am. On the last service or menu of the day, you should enter 24.00 as the ending time so that you can access the system even after business or service has ended. "Shift" may be 1 through 5 if you wish reporting by shift. Note that at the time designated the menu will switch to the next menu, regardless of a shift's starting and ending time. For example, a shift may cover three service times. "Menu" will be the primary or default menu number (1-8) designated for this service time range. See Menu Items. "Alt Menu" will be the alternate menu number designated for this service time range. You do not have to have an alternate menu. In the example above, only Menu 3 is available after 17.30 (5:30 pm). "Sun?" | "Mon?" | "Tue?" | "Wed?" | "Thu?" | "Fri?" | "Sat?" | allows you to designate days of the week that a menu is available. For example, you might have a different breakfast menu on weekends than on weekdays. If the two breakfast menus have different menu numbers, then you can designate the appropriate menu for the day. In these fields, answer Y for this menu to display and answer N for it not to display. "Redirect remote printers from-to:" should be used only temporarily so that you can change the remote printers that this terminal uses. For example, if printer unit 11 is HOT and printer unit 12 is PIZZA you may redirect all chits from unit 11 to unit 12 for all items that are designated to print to unit 11. This is done in the event a printer is down and you are unable to fix it readily. NOTE: This should be done ONLY if the redirect printer (12 in this case) is set up for this workstation both in Windows and within Execu/Touch. See Printer Setup . "'Next check' terminals (quick service):" is used for quick service only, primarily in drive-through settings. Enter the terminal number or terminal numbers from which checks can be opened at this terminal. For example, if this is Terminal 21, if you enter 22 in the "Next check terminal" field, you will be able to see Terminal 22's checks from Terminal 21 when you select "Next Check" on the order entry screen. "Special tool bar buttons:" will add additional buttons to the top of your Item Entry Screen. 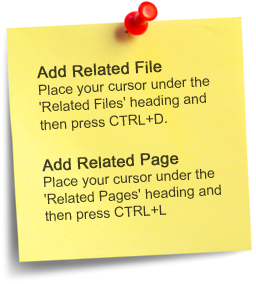 You may add up to two of the following buttons: reorder, profile, menu, modify, display, no sale. "reorder" is handy for reordering items with several modifiers, but it is just as quick to select the item and then "send" for simple items. Profile is used with Dining Reservations only and will access a guest profile for this check. "menu" will display the menu without leaving the check. 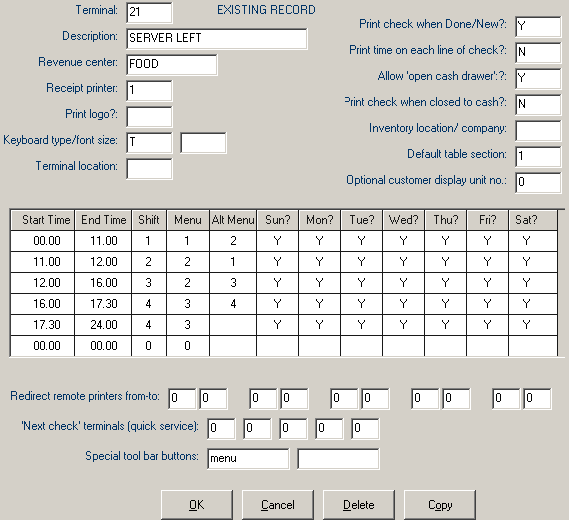 "display" will take you to Display Checks from the item entry screen without having select the 'options' button first and is handy for quick-key employees . "no sale" will open the cash drawer. When you have completed the terminal setup, click OK to save. You may then create additional terminal records. To copy a terminal record from one terminal number to another terminal number, bring up the existing terminal that you want to copy FROM. At the prompt, enter the terminal number you want to copy the terminal's settings TO. Copying terminal records cannot be undone. Make sure you bring up the terminal number you are copying FROM first. Then make sure you enter the terminal number you are copying TO at the "Copies the contents of this terminal. Enter the new terminal number (1-99):" prompt. You should make a backup of the file GAPOCNTL.FIL prior to doing this. GAPOCNTL.FIL is located in your ExecuTech or Executouch folder on the server or computer where the software was installed.